You don't see much viognier on Long Island and what is grown here usually ends up as a small percentage (20% or less) of local white blends, especially at Bedell Cellars, where it plays a supporting role in three different wines. But at Martha Clara Vineyards, it's bottled by itself every year, making for a unique opportunity to taste this grape. Martha Clara Vineyards 2008 Viognier ($18) bursts with white flowers on the nose with layers of honey, peach, cantaloupe and lemon balm. Medium-to-full bodied, the palate is peachy and floral with a little tropical fruit character. The mouthfeel is slightly rich with a bit of a glycerin feel that is cut and balanced by very fresh acidity. The finish is medium-long but does show some citrus pith bitterness. There are certain things you can learn from drinking wine and reading about winemaking or wine science. In my experience though other aspects like viticulture and canopy management can really only be grasped working hands-on the vineyard. I’ve gained some basic knowledge in the last few seasons here but there is so much more for me to learn before I go planting a small vineyard. My idea behind this video and future videos is to demonstrate basic methods of vine management during the season with at least three wineries using different trellis systems. Each has their benefits and drawbacks and I hope I can shed some light on each. This first video includes Randy Biehl from Eveningside Vineyards winter pruning his VSP cane-pruned system. Biehl was trained in the vineyards of Cave Spring Winery and he was taught that this system is best for cold climate vines. Kurt Guba of Freedom Run Winery also demonstrates some winter pruning with their VSP spur-pruned technique. Guba’s method is obviously faster and I hope readers will chime in with the drawbacks and positives of cane versus spur pruning. Located in Southampton, Long Island, the Southampton Publick House has been producing award-winning beers for over a decade. The brewery has signed on with Pabst brewing in hopes of improving their marketing and distribution as well. Brewmaster Phil Markowski specializes in farmhouse ales, but also makes delicious beers in a variety of styles, including this, the first porter they've bottled. Southampton Ales & Lagers' Imperial Porter poured a dark brown/blackish color with a thumb width of tan head. The aroma is rich, with lots of malty chocolate notes. The body is deep, with a smooth, full mouthfeel, lots of roasted malt, chocolate and some sugary notes. The finish is short and dry, complimenting the big body nicely. Overall, this is a very enjoyable beer. It is simple, yet big and one of my favorite beers of this style. This beer will pair well with meats, and even better with dessert. Any type of chocolate will work well here but a specific dish I recently had at a beer pairing dinner keeps popping back into my head -- bacon-wrapped dates with a chocolate-avocado pudding was an amazing dish that would pair very well here. Buy 6 or more bottles of Italian wine and get 50% off shipping with coupon code "lennthree"
Today I'm happy to announce our New York Cork Club selections for March: Red Newt Cellars 2007 Sawmill Creek Cabernet Franc and Lucas Vineyards 2008 Dry Riesling. If you read this site, you've probably already seen the reviews (here and here) so I won't go into the notes again, but I will say that I'm proud to have each in the club. Not familiar with the New York Cork Club? You can read about it, but the quick and dirty of it is that we've partnered with BacchusWineOnline.com to build a wine club that features only wines made in New York -- making more accessible to people around the country. Over the years, we've chosen wines from each of the state's four major wine regions and continue to seek out the most interesting, most unique and smallest-lot wines -- many of which you can't get your hands on outside of a winery's tasting room. You can sign up for a month or for a year and cancel at any time. And while the price varies from month-to-month depending on the wines selected, we always keep it under $60 and often far less. So that participants have ready access to the technical/winemaker's notes on our five wines, we've uploaded them to the site. We'll see you tomorrow night at 8:00 p.m. 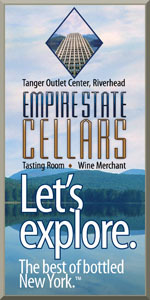 ET, so make sure that you join us on Twitter and on the Finger Lakes Wine Country TasteLive Site. All those empty wine bottles at your house? They could mean free and discounted wine. If you're like me -- and I know many of you are -- you've got a lot of empty wine bottles to deal with, many of them local. At my house, we're diligent about recycling (and I hope you are too) but Jamesport Vineyards has launched a program that might change where we do your recycling. Bring your empty Long Island wine bottles to Jamesport and depending on how many you lug with you, you can get free tastings and discounts on purchases. 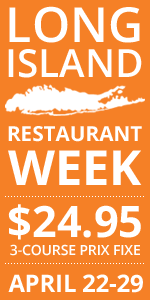 Discounts are per person, but if all of the empty bottles are from Jamesport, the deal is good for two people. According to retail manager Jake Perdie the motivation for the program is "First and foremost is for Jamesport Vineyards to continue its sustainability practices. We are interested in being as 'green' as possible while running our business." Does this make Jamesport more "green"? Probably not much. In essences this moves my recycling from my house to the winery, but this is a good program and one that I think other wineries could adopt -- especially if it brings more people to the winery and gets more people drinking local wines. All they are doing is collecting the bottles in a bin and taking them to the recycling center once a week, so it's not a huge investment or commitment. Because the project is so new the have "only had a few locals making deposits" according to Perdie, but he expect that the word will spread. When Pindar Vineyards hired Les Howard as its new winemaker in the summer of 2008, I wrote on this site that "If Les is given the freedom to make the wines that he wants to make, we can expect a sharp increase in the quality of wines coming out of Pindar's winery, which would be a very good thing." His now-sold out 2008 Viognier was among the best whites to come out of the North Fork's largest producer, but it's time to see if he's been able to up the ante with their reds as well. I have yet to taste any of his 2008 reds or his 2009s. That might change very soon however with a series of barrel tastings he is hosting in April. The winery tours and barrel tastings will be offered on the first three Saturdays in April -- the 3rd, 10th and 17th. They start at 2 p.m. Tickets are $20 (free if you are a wine club member). You can buy your tickets online or by calling 631-734-6200 x104. Don't blame the growers. Yes, they are like the real-life manifestation of Goldilocks, complaining when things are a little too cold or a little too hot. Yes, they are like your annoying friend who is never satisfied with a date, or a menu or a movie. But they are only taking up for their vines, and in New York state, vines are easily dissatisfied. And so it is with consternation that growers look to the upcoming forecast. Kids will be playing, golf balls flying, grills firing, but growers will be fretting when the mercury swells to near 80 degrees in the Finger Lakes -- and into the 70s on Long Island. Budbreak typically occurs during the first week of May, with some mild variation based on spring weather. But the coming heat -- coupled with an unusually warm March -- have the vines excited already. Why is this a problem? Because when the buds break, a hard frost could devastate the crop. And the risk for a hard frost doesn't recede "until the first full moon in May," says Damiani Wine Cellars grower Phil Davis. But what if buds break early... and no hard frost hits? "Wouldn't that be something?" Davis muses with a smile. "A long growing season and no frost. But I wouldn't bet on having no frost. It's too long a time to avoid it." "It's a little too much, too fast, unfortunately," says Heron Hill owner John Ingle about the gorgeous late-winter and early-spring weather. "There's not much we can do yet. But like anything in nature, there are myriad things involved with the vine and budbreak. For example, the vines are geared to the hours of daylight. Of course, when you get to 80 degrees, the rest doesn't matter as much. The vine is stimulated to produce sap." One day in the upper 70s won't spark budbreak, but a sustained period of warm temperatures during the day coupled with temperatures above 50 at night could make it happen far sooner than usual. When a hard spring frost threatens the buds, you can expect to smell burning hay in the late-night hours. That's one economical way that growers attempt to stave off the frost in the vineyards. "Oh, we'll be out there in the middle of the night if we have to," Ingle says with a laugh. "Been there before. But I think you need to look at how a vineyard is cropped to have a good idea of how it would handle some spring weather challenges." It's an important point. Vines with heavy croploads are much more vulnerable to dramatic swings in temperature. Ingle says Heron Hill cut crops last year and if buds break early in 2010, their careful management in 2009 will offer some protection. "Some people keep pounding out 6-8 tons an acre, and I understand why they do that, but this might actually be a helpful thing for those vines. An early budbreak followed by hard frost might lead to the cutting of inventory -- the natural way." Down at Damiani on Seneca Lake, Davis is hoping for cold nights to keep the sap at bay. But he admits he's nervous about the forecast. The spike in temperatures that has washed over the Finger Lakes hasn't translated in the same way on Long Island. March was rather mild, but not dramatically so, and while the Finger Lakes could see 80 degrees all weekend long, Long Island is forecasted to stay around 70. That's a significant difference when it comes to the life of the vine. "It takes a lot of warmth to get those vines started," writes Rich Olsen-Harbich, winemaker at Raphael. He describes himself as "not worried at all." At Paumanok Vineyards, owner Charles Massoud says, "I would be lying if I said I have no worries, and yet I can not say I am panicking. My experience is that sap begins to flow when the ambient temperature exceeds the temperature of dormancy, which is 50 degrees Fahrenheit for most people. And we always see this at this time of year. So sap flowing by itself is not a concern." Massoud explains that heat needs to be sustained to cause his buds of worry to break into panic. "For buds to swell and open you need temps in excess of 70 degrees Fahrenheit for several days, if not weeks. Lately the weather has been on the warm side and the oncoming heat will challenge us for sure." But, with a sense of perspective, Massouds adds, "Asking a farmer if he is worried about the weather is like asking the Pope if he is Catholic." At Roanoke Vineyards, Rich Pisacano is feeling some relief that the Long Island forecast doesn't mirror the Finger Lakes forecast. "Worried? A bit," he says before being told that the Finger Lakes could hit 80 degrees. "That sounds like a number worth worrying about." Hans Walter-Peterson, Viticulture Specialist at Cornell, offers an important reminder: "Different varieties break bud at different times. Varieties like Niagara or Foch or Catawba will break earlier in the season than riesling... sometimes a couple of weeks earlier." That's comforting for the riesling producers, but Hans' next point might not be: "There has been some research to indicate that the temperature of the soil plays a role in when budbreak occurs, and possibly also what rootstock the vines are on. The fact that our soils are wet right now means they will absorb more heat and warm up faster than they would if they were dry, but would it be enough to push the vines into budbreak? I don't know the answer to that." Walter-Peterson is launching a project to carefully study budbreak, bloom and other ripening events in the region's most popular varieties. The research should help Hans and his colleagues educate growers about which sites are the best choices for which varieties -- and what they can do in their vineyard to best protect the vines. With a summer-like weekend approaching, Hans notes, "I wouldn't be surprised to see at least a few buds swelling up and popping off their bud scales." Then he adds, wisely if ominously, "I try to avoid predicting anything, so I'll avoid doing so again." This is what our editors and contributors are drinking..
Every wine region needs to identify what it does best. It's a process that can take many years. I wonder if the Erie-Chautauqua region has found their most reliable red in Chancellor. This hybrid makes wine with an opaque color that either evokes Leon Millet or Mega Purple -- either way, it's dark. But it's soft and approachable on the palate. An oaked Chancellor can wear the wood on its sleeve; I'm told this version was aged in stainless steel, but perhaps the folks at Johnson can clarify. It's a touch foxy, but smooth and nicely done. It wasn't easy choosing my WWD this week because I was lucky enough to taste several fun and interesting wines (blind) last week at a dinner with some local winemakers, winery owners and wine geeks. There were some impressive upcoming local releases, some older Alsatian wines from the 1980s and this recent release from Red Hook Winery. There has been a lot said/printed about this project (see our post/comments), but I was glad someone brought this wine to dinner. I've been trying to get my hands on some for weeks. Blind, I thought it was local cab franc (one of the few I got right that night, by the way) from a cooler year. There was some nice blackberry fruit, but also spice and quite a bit of roasted jalapeno pepper. There is a bit more structure here than I'm used to with local franc (especially in 2008) and someone at the table wondered if there is some merlot blended in to flesh it out a bit. I'm not sure why, but I expected these Red Hook wines to be less regionally and varietally typical than this. I look forward to tasting more of them and exploring them more. Once again thanks to higher education I get to try wines meant for a wine evaluation college course. This past week the theme was Italian wine. If there were a region that I’m most comfortable tasting blind this would be it. That being said, in a line up of six wines, it was all too easy to pick out this Boroli Barolo 2004. With aromas of dark cherries, licorice and tar this wine was clearly in the Italian mold. The mouthfeel was rough and rustic with enormous grip for a six year old wine. If I would have forked over the $60 for this bottle, I would’ve ultimately been disappointed that I drank it too soon. While I could have left my nose in the glass for days, the palate was just too edgy. It just needs time or a perfect food pairing at this stage. I spent last week at a conference in San Francisco, so of course I wanted to visit California wine country. I rented a car and drove up the 101 to Sonoma County, where I visited two wineries. Both Michel Schlumberger and C. Donatiello poured excellent wines. I was particularly taken with the Donatiello Russian River Sauvignon Blanc, which finished exactly as if I had just eaten a Bartlett pear. However, the highlight of the trip was stopping at Russian River Brewing Company in Santa Rosa, where for $15 we got a flight featuring every beer they were pouring. If you have ever heard of Russian River, then you know this was an opportunity I couldn't pass up. The IPAs are very good, including the exceptionally balanced Pliny the Elder, their flagship brew. However, the real stars were the sour ales: Supplication, Temptation and Consecration. Sour ales brewed with Brettanomyces and other wild yeasts are a hot item among craft breweries lately. These were aged in oak and had a tart, complex, vinous quality that was really outstanding. Russian River has very limited availability on the East Coast (I think there is a distributor somewhere near Philadelphia), so if you know someone going to California, make sure they bring you back some Russian River! I bought this wine solely because of the label - something I wouldn't normally do in the States, but here I can afford to experiment a little. South Africa's WINE magazine has a column that discusses wine packaging, and this shiraz was this month's feature; the label stuck with me and when I saw it in the shop I couldn't resist picking it up. Sure, the producer is just around the corner from Blaauwklippen and I'm always interested in comparing wines that share our terroir -- but even if that hadn't been the case the simple, refreshingly understated label sold me. Fortunately, the wine didn't disappoint. The nose is quite subtle at first showing just a little meaty brett action (I'm realizing I'm going to have to review a brett-free wine next time to avoid perpetuating a stereotype! ), cherry and baked plum, and some nice floral hibiscus despite an earthy kalamata olive thing happening. Bright cherry/raspberry flavors on the midpalate gave it a down-to-earth, controlled finish. At US$6 I'd say this was a label-based purchase to which I don't mind admitting guilt. Just wanted to most a quick reminder in that our third a series of Finger Lakes Taste Live events will take place this Wednsday, March 31 at 8:00 p.m. ET. I'll be moderating for Finger Lakes Wine Country (FLWC) in conjunction with their newly launched TasteLive page. Pinot noir is showing great potential in New York, so this should be an interesting tasting that will undoubtedly open up some eyes. We will kick off the tasting at 8:00 p.m. ET, so make sure that you join us on Twitter and on the Finger Lakes Wine Country TasteLive Site. The differences between this Finger Lakes syrah and the one I reviewed a couple weeks ago might be the simple result of vintage variation -- 2007 was far hotter than 2008. Not that this wine is completely underripe, mind you. It's just not as ripe as the 2007. It has some nice qualities, but it isn't going to convince anyone that syrah is anything more than a bit player in the region. Black pepper dominates the nose, with spicy, earthy notes over top of restrained black cherry and blueberry fruit. After being open for a day, there were some lightly floral aromas as well. Medium bodied, the palate shows more black pepper over dark fruit with subtle vanilla and oak on the mid-palate before finishing dry with an earthy, slightly stemmy bitterness on the finish. The tannins are medium-light, but good acidity brings structure and balance. At $40 this isn't cheap, but only 21 cases were made, the winery's first trial with syrah. They plan to expand production in 2009 and plant more syrah as well. Are you familiar with La Paulée, the traditional Burgundian celebration held at the end of the grape harvest? No? At the time, Kareem also mentioned that he wanted to bring the concept to Long Island. Well here it comes in the form of Tour de Forks, taking place on Sunday, May 16 at 4 p.m. at one of Long Island's top restaurants, North Fork Table & Inn. "We will provide you with a communal venue and feast to enjoy the wines you've been waiting for a 'special occasion' to open. We will shut down the restaurant so you and your like-minded fellows can 'geek out' and perhaps even engage in a little friendly one-upsmanship!" The food is sure to be incredible and wine writer (and North Fork resident) Lettie Teague will act as the emcee for the feast. Tickets are $150 per person (which includes tax and tip) and you need to reserve your spot by April 16. Unfortunately, that is the one Sunday a year when I need to be in the office working, so I don't think I'll be there, but I'm not giving up yet! This is an exciting endeavor. I hope they sell out and are forced to do this a few times a year. In 2007, Dave Whiting, winemaker and co-owner of Red Newt Cellars made two single-vineyard cabernet francs, one from Sawmill Creek Vineyards and this Red Newt Cellars 2007 Glacier Ridge Vineyards Cabernet Franc ($39). The two wines are quite different -- particularly in the way in which the oak reveals itself. Smoky and decidedly more vanilla-tinged, this wine's nose also shows wonderful, lush blackberry, plum, bittersweet chocolate and subtle rosemary herbal accents. Impressively hefty a rich on the palate, fruit flavors of plum and blackberry are masked a bit by the smoke, oak and vanilla flavors. With a little time in the glass, a dusty cocoa powder note emerges along with an intriguing earthy, roasted beet note. The subtle herbaceous note from the nose doesn't carry over to the palate at all. The finish is long and a bit minerally before the oak reminds you of its presence again. I prefer the Sawmill Creek bottling a bit more, mostly because it delivers more of what I expect from cabernet franc, but there is a lot to like here too. A Taste of Paumanok Vineyards' Past. A Hint of the Future. Let's say you own a winery. A good winery. One that is often pointed to as one of your region's best, in fact. Wouldn't you dip into your library, enjoying maturing and mature bottles of your own wine regularly, just because you can? Apparently not, at least not if you're the Massouds from Paumanok Vineyards. Between tasting wines that are still being made — from tank and barrel — tasting upcoming releases to determine when they are ready for the public, selling current releases, selling those wines and promoting their winery and the entire region, there just isn't much time for tasting from the cellar. That's one of the reasons Charles and Urusula Massoud, who founded the 103-acre estate in 1983, conceptualized the "Grand Vintage Dinners" that they've been hosting at the winery. The dinners feature food cooked on-site (on a 6-burner stove no less) by local celebrity chefs Tom Schaudel and Michael Ross, and serve as the perfect opportunity for local wine lovers — and the family behind them — to taste some of the best wines the winery has ever put out. One can think of "Grand Vintage" at Paumanok as a more meaningful version of "reserve" labeling. A wine is only deemed Grand Vintage when it's warranted -- after a double blind tasting of individual lots. In even more exceptional years, a wine will be labeled with a vineyard designation, which has only happened a handful of times in the winery's history. The Grand Vintage dinner I attended last weekend — the second in a series of four — focused on six different vintages of Grand Vintage Merlot. I'm a sucker for vertical tasting and going from 2000 up through and including 2007 made for a tremendous tasting experience. The food, especially when you take into account that it was cooked for more than 50 on that small portable range, was delicious as well. We started the evening with a piece of seared salmon served with a Provence-style sauce of tomatoes, olives, capers and garlic, paired with Paumanok Vineyards 2001 Grand Vintage Merlot, a beautiful wine showing mature secondary and tertiary flavors of earth, dried herbs and spice layered with dried and fresh cherry fruit. A graphite note on the finish worked extremely well with the briny olives and capers. Kareem Massoud, who has taken over the winemaking duties from his father, said it was tasting “better than I ever remember it tasting.” It's probably not possible to say for sure that it's peaking right now, but it's really in a great spot in its development. Next up was grilled quail with mushroom risotto, blueberries and chantrelle mushrooms alongside Paumanok Vineyards 2002 Grand Vintage Merlot. Poured from magnums it was much more youthful and fruit-forward (wines age more slowly in larger bottles), with bright red cherry flavors leading the way with earthy tobacco, spice and savory spice notes. In the larger bottles at least, this wine has plenty of life ahead of it. This may have been my favorite pairing of the evening. Near perfect. For the third course, we enjoyed (greatly) Jurgielewicz Farm’s duck breast with sweet potato-roasted banana puree, haricot verts and a raspberry glaze. This course was accompanied by two widely different wines — the 2004 and 2005 Grand Vintage Merlots. From a cooler and perhaps more regionally typical year, the 2004 was almost Burgundian in its mushroomy earthiness, elegant fruit and subtle floral notes. The 2005 on the other hand was intense with dark, ripe fruit, black licorice and ripe, grippy tannins. If you get your hands on some, don't open it for at least another couple of years. Before diving into dessert, we were presented with a wedge of truffled pecorino cheese with roasted tomato, extra virgin olive oil, rosemary and fennel pollen. The wine, Paumanok’s 2000 Grand Vintage Merlot, showed nice weight and mature earthy flavors and a distinct minty-eucalyptus note that played off the rosemary well. Red wine with chocolate is a discussion for another time (I’m not a believer though, so maybe I won't bother) but poured alongside a bittersweet chocolate terrine with hazelnuts and raspberry puree, we enjoyed another big, powerfully young wine, the just-released (the day of the dinner) Paumanok Vineyards 2007 Tuthills Lane Vineyard Merlot, the winery's first vineyard designated merlot. Bold, ripe blueberry flavors burst from the glass with black licorice, spice, dark chocolate and French roast coffee. This wine is the complete package already — ripe, concentrated and extracted, with great structure. If the 2005 is young, this one is an infant. Buy some and lay it down for another 10 years. Or buy more and check in on it every year or so. I can't remember who said it, but the words "Might be the best wine we've ever made" escaped from someone's lips during this course. Time will tell on that point. Paumanok will be hosting two more Grand Vintage dinners this spring — a Magnum dinner on April 24 and a 2001 Grand Vintage dinner on May 22. Visit their events page for details. I can only hope that he Massouds enjoy their library wines more often and that they invite me over to share in them. Despite all the naysayers in the media and various wine geek circles, some Hudson River Valley wineries have really embraced hybrids and are making far more serious wines with them. Hudson-Chatham Winery in Ghent is one such winery. They make a line of vinifera reds, but that fruit comes from Long Island. Their riesling is made with Finger Lakes fruit. The most interesting wines in the portfolio -- the ones that deserve the most attention -- are hybrids like baco noir and this soon-to-be-released Chelois. Winemaker Steve Casscles has been growing and vinifying hybrids for years and makes some unique, expressive wines from them. Before trying this wine, I had never tasted Chelois one of over 16,000 hybrids developed by Albert Seibel (1844-1936). Nearly 500 of them went on to be grown commercilaly. The heritage of Chelois includes such vinifera as Alicante Bouschet and Grenache among others. For many years it was grown in Burgundy. This Hudson-Chatham Winery 2008 Chelois ($22) is made entirely from fruit grown in Casscles own vineyard -- a 15 year-old block located on the rocky hills adjacent to the Hudson River. Hand picked, the fruit was manually pressed and aged in French oak for nine months, the wine was bottled unfined and unfiltered. It's interesting that the Chelois grape was once grown in Burgundy as there is something distantly Burgundian about it. The nose shows a lot of sweet vanilla and oak at first, but also red cherry, dried cranberry and a distant black pepper-crusted grilled mushroom note way in the back. Soft and light bodied, the palate shows more of a vanilla oak than a toasty oak, with more dried cranberry and cherry flavor. The acidity is subtle but makes the medium-short finish fresh, dry and clean. Without any tasting history with this grape, I won't delve into the potentially hyperbolic, but there certainly seems to be potential here. This is a good start. The easy part was the business plan. The hard part was the wine. For a family of three boys and their wine-loving father, the business side would work itself out. The boys had known since childhood that they'd figure out a way to work alongside their energetic, labor-loving father. It didn't hurt that he was a long-time cardiologist who made a good living -- good enough to support a new winery. But Dr. Fred Zugibe was more than just the money. He surprised his three sons -- Fred III, 34; Brendan, 32; and Sean, 27 -- with his desire to do the hard work in growing grapes and building a winery and making wine. Fred III had studied winemaking and would craft the wines. Brendan was trained in business. Sean could handle the vineyard. Dad would do whatever the boys needed him to do. He was only 54, after all. He felt great. Long before their tasting room opened, the Zugibe boys purchased grapes and were on their way to their first Finger Lakes vintage. They hardly had a wine home, but they would at least have their own wines. The rest could come later. That wet harvest of 2006 was a challenge, but they instantly loved the work, dripping wet and laughing as they brought in their first grapes as a family. How strange, then -- how sick and unfair -- that dad the cardiologist never knew he had a heart condition of his own. It was a rare kind, the kind he had spent years detecting and treating in other people. It was snowing hard that November night in Newark when a section of Fred's heart burst like a dam. The winds were so severe that there was no way to get an emergency transport aircraft to him. By the time his wife was able to pull into the hospital, Fred was essentially dead. He never held a bottle of Zugibe wine. Had he lived just one more week, he would have had a chance to at least taste one. Three years after their father died, the Zugibe brothers finally opened their own tasting room on the northeast side of Seneca Lake, just south of Geneva. It is a large, beautiful, and meticulous structure -- but I wondered if it felt a bit empty when I spent the afternoon there with Brendan Zugibe. "Dad was everything," Brendan told me. "He still is. We still haven't recovered." But I was happy to see that, for all of the shock that their family tragedy delivered, Brendan radiates with ebullient energy and a sense of purpose. The Zugibe Vineyards tasting room is a joyful place. Brendan smiles constantly -- especially when recalling his father's personality and impact -- and he presents the Zugibe wines with the nervous enthusiasm of an artist at his first studio unveiling. It was Brendan who created the label design, which can be seen on the bottle and on the sign that marks the entrance to the facility. He chose a phoenix, the mythical creature that rises from the ashes. "We didn't know what the label should be for a while," he explained, "but when we lost dad, I knew what it had to be. We miss him, but we're rising out of that adversity to accomplish this dream." Like so many Finger Lakes wine producers, the Zugibe brothers have taken on debt while cash flow remains tight. "It's really humbled us. It's taught us so much, but we're doing it. We're going to be okay. It was a huge step to open the tasting room." The Zugibes planted 40 acres of grapes, 15 of which are riesling. Brendan explained that they looked for warm sites with untapped potential. With several sites under consideration, they logged temperatures over the winter to look for susceptibility to cold snaps. The analysis revealed "no red flags, but this site was slightly warmer. It was just what we needed," Brendan told me. As Finger Lakes sites go, it is relatively flat. But like many vineyards on the east side of Seneca Lake, the top parcel is the flattest, with slope increasing as the vineyard moves toward the water. Zugibe has some of his riesling planted in the top 17 acres and some in the bottom 23, and already the brothers are searching for differences in what the sites do to the wine. The remaining acres are planted to a variety of grapes, including a bit of Gruner Veltliner, which excites Brendan. But next to riesling, this is a family that loves cabernet franc. To my surprise, not a single wine on the Zugibe list was a clunker. I'm not surprised because I doubt their abilities; rather, young wineries tend to need time to work out the trouble spots. I found the Zugibe wines to be extremely clean and solid. The wines were not inspiring, either, but that's to be expected at this stage. The utter lack of flaws mattered most. And the 2008 vintage shows some serious promise in the Zugibe Dry Riesling, which is the first Finger Lakes dry riesling I've found to show a kiss of white chocolate. Zugibe produces a range of cabernet franc and cabernet franc blends, and the standout for now is the 4 Freds Red, which consists primarily of cabernet franc and Blaufrankisch but is accented by merlot and cabernet sauvignon. At a blind industry dinner last week, the Zugibe 4 Freds Red was the group's choice over a high-wattage red blend from the Napa Valley (which, to be fair, suffered from an assault of new oak). Brendan spoke highly of his brother's winemaking skills while simultaneously heaping praise on their Seneca Lake winemaking neighbors. "We've had offers of help from the moment we arrived. We're learning every day by experience, but when we have a question that needs an answer right away, there is always someone there to answer it. Always." This producer continues its gradual rise from the ashes. They'll aim for 5,000 cases in 2010 with a long-term goal of roughly 10,000 cases annually. The land outside the tasting room is ripe for private parties and weddings. If Zugibe Vineyards carries a theme in this nascent stage, it is that wine is a celebration of life - and life offers no guarantees, so we might as well not delay the celebration. Some announcements and happenings from around New York wine country. If you have news that you'd like to be considered for this almost-weekly column, please let us know via email. Damiani Wine Cellars is offering a five-part vineyard training designed to allow participants to "follow a vineyard from dormant vine pruning to harvest." Grower Phil Davis will lead the sessions, which are slated to run 90 minutes each. The first is April 3 and will provide a vineyard tour and lessons on pruning. Later sessions will focus on trellis work, shoot thinning, and harvest preparation. Participants will have the chance to work with native grapes as well as noble European varieties like Pinot Noir. Sessions costs $25 each or $110 for all five courses. Damiani, located on southeast Seneca Lake, will limit the group to 15 people. Martha Clara vineyard manager Jim Thompson and winemaker Juan Micieli-Martinez have announced a program they are calling "Vines to Wines." During this five-session seminar, participants will learn about what it takes to grow grapes on Long Island and will maintain their own block of merlot that will be harvested in the fall and made into wine. It kicks off on April 24 and costs $1,200 and includes three cases of merlot from the block participants maintain throughout the season and a wine dinner at the the end of the last session. Visit the MCV site for more details. If you've visited Sherwood House and tasted their wines in the tiny, un-heated shack smack dab in the middle of their vines and wished they had a tasting room that was open year round, wish no more. Owners Barb and Charles Smithen have just approval for the opening of their second tasting room at 1291 Main Road in Jamesport. The grand opening is this Saturday (March 27) from 11 a.m. to 7 p.m. The original "tasting cottage" will open for the season in May. When Raphael winemaker Rich Olsen-Harbich released his first Naturale -- a 2008 white blend (read the NYCR review) made without the addition of sugar or acid, without filtration or fining, and using naturally occurring yeasts and only the slightest bit of SO2 during bottling, I was intrigued. I look for deliciousness in wine, rather than a particular style of winemaking. Natural, biodynamic, organic, sustainable -- they all matter on some level, but not if the wine isn't delicious. That 2008 received a 4-start rating and was a finalist in the NYCR Wines of the Year. Raphael 2009 Naturale White ($20), at least at this stage, isn't quite as good as the previous edition, but still an incredibly interesting wine to drink over the course of an evening. I'm no where near an expert on wild ferment wines, but the complexity and non-fruit character it seems to bring appeals to me. The nose still smells a bit of fermentation and tiny bubbles cling to the inside of the glass. But once that curtain is pulled back, nuanced aromas of fresh and honey-roasted apple, lemon curd, pineapple, hazelnut, citrus blossom and sweet herbs emerge. The medium-bodied palate is at once fresh and creamy, thought a bit simpler. A bit more nutty than the nose, the apple flavors dominate with subtle honey and citrus notes. The finish is medium-length and dry with a earthy-herbal note. If the 2008 is any indication, this wine will evolve quite a bit -- and quickly -- in bottle, so I'll check in on it again soon. El Paso Winery NV "Just Plain White"
A friend of mine in the Hudson Valley gave me this bottle of El Paso Winery NV "Just Plain White" ($10) and I knew next to nothing about it when I tasted it. And, after visiting the winery's website I don't know much either, other than that it's a "medium to semi-dry Chenin Blanc blend" even though the label says "Dry Table Wine." I tasted it before visiting the website however, and I wouldn't have guessed chenin blanc at all. The nose is very seyval blanc-like to me with apple and that dusty earthiness that turns me off about the grape. There's some sweet fruit there and a bit of the foxy aroma often associated with hybrids and natives. I scribbled "Seyval and Cayuga?" in my notebook. Hopefully I can find out what was blended into the chenin for this (and also where that chenin came from). A bit fruitier and foxier on the palate, the residual sugar brings nice mouth-filling roundness to the wine and there is nice acid on the finish to keep it from being too sweet, but it falls a bit flat in the mid-palate where it's a little watery after a apple-y start. Evan Dawson, our Finger Lakes Editor, and I have been working hard to get all of the plans and details together for this year's edition of TasteCamp EAST, taking place May 7-9 in Finger Lakes wine country. The concept for TasteCamp is a simple one -- getting enthusiastic bloggers together in a region that is new to them to taste as much wine as possible and speak to as many winemakers as possible over the course of a weekend. Most smaller, lesser-known wine regions in the world would love to get their wines in front of bloggers, but with TasteCamp, the bloggers come to them. After the huge success of last year's Long Island program, we wanted to head up to the Finger Lakes and have been met with boundless enthusiasm on the part of the wineries in the region. We're still sorting out some of the details (times, locations and number of wines per winery) but if you'd like to pour for the 40+ people attending TasteCamp this year, please send us an email as soon as possible. The deadline for signing up to pour is Sunday April 4 at 8 p.m.
Knowing Biehl, you don’t chalk this up as simple boilerplate pessimism, but rather to his meticulous planning and outlook for his winery. The road to what is now Eveningside all started in the 1990s, when the Biehls began exploring wine and making trips to Niagara-on-the-Lake, Ontario. The wine industry there was already flourishing and its success inspired the couple to wonder why there hadn’t been any movement toward the cultivation of wine grapes on the New York side of the border. And with that, Biehl began his search for property, knowing he either wanted an Escarpment or lakeshore location. During his 18-month search, the area’s first winery, Niagara Landing, opened, followed quickly by Warm Lake Estate. It was also during this period that Biehl was getting hands-on experience in the vineyards of Cave Spring Winery in Niagara, Ontario. He then took the first major step when he planted one acre of grapes behind the old farmhouse they purchased on the bench of the Niagara Escarpment. Chosen mainly for their cold-hardiness, he put in a mix of cabernet franc, chardonnay and riesling for his initial planting. As his vines matured and he became more comfortable with growing, he began looking for a winemaker. It turns out he didn’t have to look any further than the vineyards his was training in. To his surprise the vineyard manager there mentioned that Angelo Pavin, winemaker for Cave Spring, might be interested in working with Biehl. Seven vintages later, Angelo is still the winemaker for Eveningside. The wines have gotten better and better along the way, with some standouts like his rieslings, 2007 Cabernet Franc and his 2008 unoaked Chardonnay – which was recognized as the best Niagara Region white wine by the NYCR. Making wine in such a tight space – a mere 1200 square feet – never meant for such ambitious projects wasn’t easy. “Something as simple as a floor drain we didn’t have. That means you’re using mops and buckets after cleaning tanks…everything just takes longer,” says Biehl. It also prevented him from having the freedom to do things like bottling on a Friday because that same space would need to be ready for the public the next morning. Space issues are no longer an issue with Eveningside's new 2800 square foot production building completed just in time for the 2009 harvest and on schedule with his recent retirement after 30 years in a government job. He’s looking forward to the convenience of having a large dedicated building just for winemaking. “Everything’s just going to be easier,” he says. And with that he thinks his wines will improve even more with the ability to easily cold-stabilize tanks by moving them outside and back in with his new tow lift. Biehl is also convinced his temperature- and humidity-controlled barrel room will add to the quality of his wines, reducing evaporation and the need to top off as often. The most immediate impact his building will make is in capacity. He’s gone from the ability to produce 750 cases to 2000, with his first move toward this increase in ramped up riesling production. In addition to his estate-grown riesling – which he plans to keep dry – he has sourced grapes from Lake Erie this year to produce a semi-dry riesling. As he sits in his office overlooking his vines, tasting room facility and first floor of his production room, Biehl seems to be enjoying his new building. But while you’d think he’d be relaxing and taking in his new surroundings, he’s already making plans for his next big move. “We’re not sure if we’re going to put in some more vines or build an adjacent tasting room to this building,” adds Biehl. Either of these projects may come as soon as 2011. I’ve personally always wondered why Eveningside had stayed so small for so long, even as their wines began to rival some of the best New York wineries. Now I know it’s no accident. Indeed, it’s been Biehl’s plan all along: this is just the beginning of his hobby becoming a full-time business. It's been a while, but for the first time in I don't know how long, we've all chosen wine for What We Drank. And each really is special for one reason or another. Five to eight years. There's your current window for how long you ought to lay down your favorite Finger Lakes Riesling. If you don't occasionally lay a bottle down, you're missing out on a fascinating array of flavors and developments. This outstanding bottle from Hosmer is just another piece of evidence of that. In a blind industry tasting and dinner, I was first moved to believe this must have been from the Mosel. That's because it delivered a kind of richness and mouthfeel without seeming tired. There was a nervy, tense finish to the wine. I'm glad that I added a caveat that it might be a Finger Lakes riesling, albeit a slightly older one. This wine has more time to go. My recommendation of five to eight years is based on sampling numerous older Finger Lakes rieslings, and I can say that the best of those bottles can go well into double digits. But considering that most consumers don't give wine more than a few months before it's popped and gone, I think the five-to-eight window is a good start. Much like my esteemed Finger Lakes colleague, I've opened and tasted a few older Long Island wines of late. A week ago, I opened a 2001 chardonnay that was nearly fruitless and clearly over the hill, though still showing good acidity to balance a subtly creamy mouthfeel. Mediocre experience at best. Then this past Saturday Nena and I attended a Grand Vintage Merlot dinner at Paumanok Vineyards. We tasted merlots from 2000, 2001, 2002, 2004, 2005 and 2007. Now we're talking. Some have said that the mark of a 'great region' (whatever that means) is age-worthy wines. If that's the measuring stick, check out this nine-year old 2001. Mature earthy and dried herb flavors mingle with dried cherry and an Old World-esque minerally graphite note that I loved. Smooth and really "together" it might be peaking, but there seems to be a bit more life in it. In fact, I'm banking on it -- I bought some on the spot. I wasn't the only one who was impressed. Paumanok winemaker Kareem Massoud was sitting to my right and said that it was "Better than I ever remember it tasting." He didn't say that about any of the other wines. I think that says something. I plan to pull a few 2001 reds from my cellar this week and taste them soon. Should be fun. I chose this wine in honor of Human Rights Day. It's a wine from one of South Africa's first black-owned wine farms, founded by the Rangaka family in partnership with well-known producer Villiera. On this 50th anniversary of the Sharpeville massacre in South Africa, during which 69 civilians were killed at a peaceful protest shortly before the government banned all black political organizations, it seemed fitting to support one of the growing number of wine farms promoting black empowerment and a more equalized economy. Pinotage has to constantly defend itself to American wine geeks, it seems; often I feel as if every bottle of pinotage has to apologize for the cultivar as a whole. I don't take this attitude -- unless it shows too much banana or burnt rubber, I dig pinotage in all its earthy, bretty glory, and I'm not looking for it to taste like something else in order to enjoy it. Living in South Africa means I have access to the tasty everyday quaffers -- in other words, the middle ground between the cheap schlop and the relatively expensive high-end stuff. This M'Hudi, at about $5USD, is a fine example. On the nose it's all pinotage: plummy, spicy, gamey, with a nice perfumey quality to round out the brett action. What makes this wine special, to me, is the mouthfeel -- rich, fleshy fruit, firm acidity and tannins that produce a nice complete finish. If you're not a pinotage fan this isn't the wine to win you over, but with bitter aniseed chocolate and figs for dinner I found it a great way to enjoy my day off. After tasting several New World pinot noirs and discussing what indeed makes them Burgundian, my coworker and lover of all things pretentious set out to answer the mystery by opening a 2000 Grand Cru from his private stash. Specifically we were interested in how much tannic grip you could expect from a top-of-the-line pinot noir. Since the new world stuff we were drinking was from recent vintages, this 2000 wasn't the best wine to compare but it was still appealing. Ripe black cherry, hazelnut and intense barnyard on the nose but as it opened the barnyard fell back a bit. Supple mouth feel with fine but yet still firm tannins. On the finish the fruit lead the way, both full clean and lasting. This was a very Old World-style example of Burgundy. It was an overall impressive wine and stylistically in a class by itself. The earth and barnyard flavors just wouldn't fly in a New World wine in my opinion, but in Burgundy it is what it is. In my limited experience, I found the firm tannins to be a surprise considering the age. Definitely a fun wine and a treat to taste. Extraction and focus like I've never experienced in a zinfandel. So tightly knit, so beautifully balanced. Layers upon layers of flavors and nuance, from dark chocolate to black cherry to bell pepper to melted raisins to hints of white pepper and mocha. Smoky and seductive. Beautiful mouthfeel. Lush and luscious, with the kind of concentration most winemakers pray to achieve. Alas, I have no idea what food I would pair this monster Zin with but I don't care--who needs food when you have an elixir like this in your glass? But if I must, maybe leg of lamb roasted over pinion wood on a spit. Or a big ole slab of Bistecca Fiorentina, charred rare over hot coals. Kudos to owner and winemaker Donald Thiessen, who dry farms his Paso Robles fruit and vines and practices sustainable grape growing. 80% Zinfandel, 20% Syrah. About $40. Genesee Brewing Company is a regional favorite in Rochester. In addition to the traditional Genesee line of beers, the brewery produces the Dundee Ales & Lagers line which, includes an IPA, porter, brand new seasonal Irish Red Ale, and the Honey Brown Lager. Dundee Honey Brown was first introduced in 1994 and quickly became a regional favorite. In the late 1990s the brewery started to tinker with the beer. The recipe remained the same, but the packaging, was changed, the price went up and it was pushed as more of a "craft beer". When sales plunged, Genesee decided to revert back to the old packaging and throw its marketing support behind the classic beer. The beer is made with water, barley malt, hops and pure Manitoba White Clover honey. Dundee Honey Brown poured a clear, dark yellow color with a finger width of white head. The aroma is slightly malty with a noticeable sweetness. The body is smooth and thicker for a lager. There is a malt base with a sweetness before the beer finishes with a light dryness. Overall, this is an interesting beer from Genesee, yet ultimatly just average at best. It is easy drinking, but the honey is a little overwhelming and the finish is lacking. This is a truly unique beer to pair with food. The honey allows for some diversity and the malt backbone would pair well with some light meat. Any number of chicken dishes would be an ideal dinner for me to enjoy while drinking Honey Brown. New York's agricultural commissioner can learn something from Danny Wegman when it comes to being direct about an issue. At a news conference on Tuesday, Wegman was willing to be honest about what will happen if New York grocery stores are permitted to sell wine: He'll make more money and some liquor stores will close. His honesty was refreshing, especially when compared to New York's ag commissioner who was in Syracuse on Monday touting a new government campaign to bring wine into grocery stores. The official name of the campaign is "Convenience is Choice: Bring Home the Wine." The official line is that New York produces nearly 200 million bottles of wine but that it can only be sold in roughly 2,500 retail outlets. By selling wine in grocery stores, the government claims, the local wine industry will grow by 20 percent. As someone who has analyzed policy and proposals, I keep waiting for more data to support that 20 percent claim. We all know what the government is after: more tax revenue. And to their credit, government leaders have acknowledged that this plan would attract millions of dollars. But every time they seem to gravitate toward an honest explanation -- short-term tax revenues -- they fall back to a position of support for the New York wine industry that rings a bit hollow. Why is that? Well, the superficial market analysis put forth by the state is so blissfully ignorant of anything approaching price points, consumer choice and distribution realities that it's not even worth de-constructing. Every conversation about the impact on New York state wine ought to include these points, but instead we get platitudes that come off as half-hearted. Needless to say, we all know that the issue is extremely complex because wine marketing and consumption is a complex business. Albany's appeal to support New York wines plays as a PR move because we continue to wait for the substance to back up their claims. And if the prime motive is taxation, is it possible that industry growth is also a motivation? The track record is not good. New York state justifies tax increases by claiming an expertise in industrial development when there is overwhelming evidence that the state is extremely destructive of native industries. No one wants to see deleterious effects on the New York wine industry, but it's hard to evaluate the potential future results when the state is focused so strongly on a short-term budget solution. The executive branch spends our tax dollars to promote these proposals. We don't have current figures for how much they've spent on the PR push for this issue, but it's not free. And yet despite all this banter there could very well be a long-term benefit to New York wineries by allowing grocery store sales. We simply can't accurately assess that claim because the state has offered nothing more than the same spin that follows many other short-term revenue boosting proposals. If there is an answer to that question, it probably lies in a real survey among wineries and distributors, a task that the state has not bothered to approach. Wine may or may not belong in New York grocery stores. Thanks to Albany, analysis of real outcomes has taken a back seat to politics as usual. Editor's Note: In addition to being a wine lover, Jason earned a Master's Degree in Public Administration from the Maxwell School at Syracuse University and has worked in economic development and in policy analysis for political campaigns. Anthony Road Wine Company's associate winemaker, Peter Becraft, sent us this picture this morning. Green riesling...it must be St. Patrick's Day. Enjoy!